This copy of Arkham Horror is from Fantasy Flight's second printing of the game. 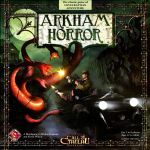 This rulebook has been revised from the first printing to incorporate the errata listed in both version 1.1 of the Arkham Horror FAQ (available at www.fantasyflightgames.com) and in the Dunwich Horror expansion rulebook. Three cards (Flesh Ward, Healing Stone, and Lantern) and the starting possessions of two investigators (Bob Jenkins and Jenny Barnes) have also been revised according to the FAQ v1.1 errata. Otherwise, there are no changes to this version that affect gameplay.